"Always be a first-rate version of yourself instead of a second-rate version of somebody else." 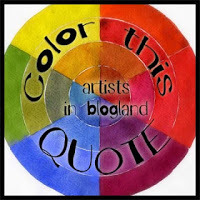 Judy Garland This is the quote for Colour this Quote at Artists in Blogland’s monthly challenge. I’ve decided to do a digital version this month using two paintings I have completed in the last few months, they are both gouache. The first one I abandoned as it wasn’t going how I wanted. The second, I did for a journal page but never got around to finishing as I thought it was too pretty! I scanned them into Photoshop and merged them, and then I used various brushes I had down loaded recently from website Annika von Holdt’s Brush Gallery. Then I put a mask on to keep the face smooth and then sharpened the rest a lot to give an engraved feel to the quote. I love this quote as it hits home for me. I have been guilty of trying to be like other people that I have admired and of course did not hit the mark. I did not believe in myself, and ended up disappointing myself. Now, I am happy to say I strive to be the best of me, not the best of someone else. It is hard sometimes, as you have to take leaps into the scary unknown, but so far I am hanging in there rejoicing in my uniqueness! I have decided to start a linky on my Christian blog. It is for journal pages about your faith. If you are interested check it out here. Here is an example of one of my faith journal pages. Wow Sharon..so beautiful..gorgeous and inspiring work..you are fantastic...and I love what yo shared..so profound and deeply touching...I think you are a beautiful spirit and magical soul..I love the quote too..it is powerful! happy ppf...I so enjoyed your beautiful art and wise words! Beautiful, absolutely beautiful art. Thank you for sharing. What beautiful work you've done- and hybrid too! Love the merge of digital and traditional! Wow... I am impressed with your photoshop skills! Amazing. And that second painting is very beautiful! Love the mixing of digital and traditional media. Beautiful colors and creation. Thanks for joining us at AIB.